For the past month, I’ve been spending time in the San Francisco Bay Area — the South Bay, to be specific. It’s not been a thorough tiki scouring — I’ve more or less done that here before — but I have made a few tiki pitstops while here. The Tiki Art Two art show and the preceding APE Extravaganza took me into the city. The APE show was a blast as always, though I learned that I do not have a future as a hula hoop champion. Before APE took the stage, we were treated to a series of short bits of film from Domenic Priore and Brian Chidester. 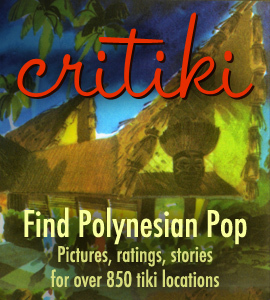 These film clips touched on everything from Eden Ahbez & Nat King Cole, old surf music clips, old Los Angeles tiki architecture, even footage of turn of the century tourists in Hawaii. It was the highlight of the night. The next day we met up with folks at the San Francisco Trader Vic’s before heading over to the Shooting Gallery for the main event. While at Trader Vic’s, we learned the previously mentioned news that Martiki is bartending there now. He introduced us all to an excellent, classic drink that isn’t on the menu, the Hinky Dink’s Fizzy. Our group found it very difficult to leave Vic’s for the gallery. By the time we got to the art show, it was packed. This picture of Tiki Art Two curator Otto von Stroheim & me was taken by Laura Gilmore. We snagged some swell stackable tiki mugs from the Munktiki vending machine, made the rounds to say our hellos and see the artwork, then headed to Original Joe’s to get some much-needed food. Original Joe’s is a great old classic steakhouse. Afterward, we headed right back to Trader Vic’s. I have a feeling we’ll be spending more time there. As a matter of fact, we headed back to the San Francisco Trader Vic’s again the very next weekend to celebrate my birthday. It was drinks at Trader Vic’s, and then dinner at the Tonga Room in the Fairmont Hotel. The Tonga Room is a tough one — the room there is just awe-strikingly lovely: a central pool, complete with periodic rainstorm and floating boat (with band! ), a row a palapa huts, nice and dark, and lots of really beautiful tikis. It’s a great old classic place, but… the food, drinks and service are just dreadful, and the band is so loud that it kills the ambience. Take away all that tiki loveliness, and you’ve got all the class of a snack cart. It’s really a shame. Despite all that, it’s so beautiful that it’s worth visiting every now and then. We also popped into the Palo Alto Trader Vic’s while here. This Trader Vic’s has a very different feel — like most Trader Vic’s, it’s actually a franchise location, which is more apparent here than at any of the other U.S. locations. It feels a bit like a generic upscale resturant that just received a shipment of priceless Oceanic Art. There are some very unique, very large, and ultimately very nice pieces of art at the Palo Alto Trader Vic’s, but it’s presented in a clean way. It probably makes it a bit easier to really appreciate the individual pieces, but they don’t come together into an immerisve environment. It was a Trader Vic’s themed visit this month — we next headed to the monthly “Last Thursday” tikiphile gathering in the East Bay. We met up with the friendly local crowd at the Emeryville Trader Vic’s, and then headed to the Conga Lounge in Oakland. This new monthly gathering has been really great fun, I hope to be making it to them regularly. A non-tiki stop on our itinerary was Nola restaurant in Palo Alto. Those who enjoy themed environments might like this place — it’s an open-air courtyard surrounded by a two-story building, with folk art from New Orleans everywhere. It’s very well done, and the food is excellent. Now we’re headed back on the road again, this time to Florida. Our travels will be taking us to Fort Lauderdale and the Hukilau (Mai Kai! ), and then we’re going to Orlando to spend some quality time at Walt Disney World. After that, we’re heading straight to Modesto for the Hooptylau event. And then — we rest. Well, sorta. Once our crazy travel schedule wraps up, we’ll be taking some time to do some consolidation — looks like I’ll be moving to the Bay Area! We both love Los Angeles completely, but life and work is taking us to the Bay Area for a while. Between our Los Angeles friends and our Disneyland Annual Passports, we’ll have plenty of excuses to make frequent visits back to L.A.
Is it just me, or does Otto’s head look like a hardboiled egg in that photo? Congratz on your promotion to Bay Aryans. Hopefully, I’ll be able to catch up with youse guys the next time I’m in SF. Hanford & I would love to meet up with you! Do you get to SF often? Oh dear, I hope it doesn’t involve sticking Otto’s head in a pot of boiling dye! I’ll be in Mountain View next week and back again in February. yeeeea! im glad you guys are going to be bay area folk for a while. good luck with apartment hunting! and isnt nola’s good??! i had the pleasure of dining there on my bachelorette party night. people kept asking me if i just flew in from hawaii due to the lei i was wearing. eh…it wasnt worth explaining. just down the street is a great irish pub, located in the only alley (oooh, scaaaary) in upperkrust palo alto. the rose and crown. a must for a guinness.